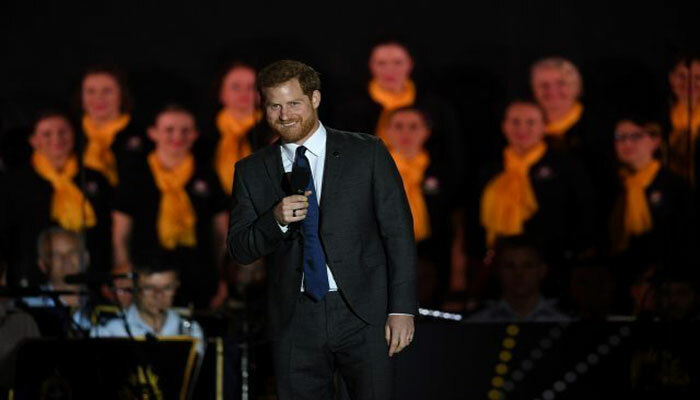 Prince Harry opens Invictus Games after storm delays - Jago Times "English Edition"
SYDNEY: Britain´s Prince Harry on Saturday opened the Olympic-style Invictus Games for disabled and wounded soldiers at a moving ceremony on the forecourt of Sydney´s Opera House, after an intense thunderstorm forced an hour-long delay. The Duke of Sussex, who climbed the Sydney Harbour Bridge on Friday to help raise the Games flag, welcomed more than 500 competitors from 18 nations to an event that he founded. “Over the last four years the Invictus Games have become about so much more than the thousands of competitors who have taken part,” he said on a stage shaped like a boomerang, following a belated traditional Aboriginal welcome ceremony that was held up by torrential rain and lightning. The prince said the concept was particularly relevant in 2018, the centenary of the end of World War I. “It feels a fitting tribute to the legacy of that generation to continue to support those who have served their country today,” he said. Earlier Saturday, Harry and his pregnant wife Meghan opened an extension to a war memorial in the city before handing out the first Invictus medals in a driving challenge, where France won gold. The Games might be Harry´s brainchild, but they are also special to the couple as it was at the 2017 event in Toronto that he made his first appearance with the American former actress, then dressed in ripped jeans and a casual white shirt. They met in 2016 and dated under the radar before going public at the Canada event. “I have been so proud to be able to introduce my wife to you and we have been so happy to celebrate the personal joy of our new addition with you all,” he said in a message to Australia in wrapping up his speech, referring to their yet-to-be-born baby. Founded by Harry in 2014, the Games are an international sporting event for wounded, injured and ill servicemen and women, both active duty and veterans. The prince, a former soldier, has previously spoken of how he was profoundly moved by witnessing death and life-changing injuries while on deployment in Afghanistan, coupled with the grief and sadness that went with it. That sparked an idea to use sport to inspire recovery, support rehabilitation and recognise the crucial role played by family and friends. It culminated in the inaugural Invictus Games in London in 2014, with its stature growing since then over two more events in Orlando and Toronto. Those taking part in Sydney will compete in 11 medal sports over a week, many at venues that hosted the Olympics in 2000. Australia has embraced the concept with most tickets sold out. Cycling and sailing are held on Sunday with indoor rowing, wheelchair tennis and sitting volleyball beginning on Monday. They are due to attend the cycling on Sunday before heading to Queensland´s Fraser Island, the world´s largest sand island, and then jetting off to Fiji, Tonga and New Zealand.